Eleanor and Michael went to the deserted Arizona public library. Eleanor managed to convince Michael to fire up a memory machine that Janet had stolen from the afterlife. Michael turned it on for a three second time period which resulted in Eleanor losing most of her hair as well as all of her teeth. Michael assured her that she would return to her normal appearance in a few minutes. After a rest period, Michael showed Eleanor some of the best parts of her life with Chidi. Eleanor was shown Pick-A-Pet Day, Chidi had some trouble deciding on which of two dogs to adopt. Eleanor had quickly picked a lizard, while Tahani was intrigued by the Mirror Centaur, whose appearance reflected its owners. Chidi finally decided to adopt an owl, as he took to long to get one of the puppies. Back at their house, Chidi expressed his distrust of his newly acquired owl. Eleanor agreed to go and speak to Michael about getting Chidi a dog. She went to find Michael and ran into Tahani. Eleanor tried to ride Tahani’s centaur but was quickly rebuffed. Michael arrived and agreed to Eleanor’s proposal to get Chidi a dog. He also asked Tahani to host a pet-themed party later that night. Eleanor quickly lost her pet lizard and went out to find him. Chidi decided to skip the party to assist Eleanor in finding her lizard. The pair escaped to Mindy St. Clair’s house and Eleanor was shown that she and Chidi had fallen in love. Eleanor was then shown how that reboot of the simulation ended. As it turned out, Michael had forced everything in the simulation to happen exactly the way it had. This forced Eleanor to come to the realization that she truly couldn’t ever fall in love unless someone made it happen for her. Michael began to rebuff Eleanor’s point, but she countered with the theory of determinism. The pair were kicked out of the library and went to a local diner. Michael decided to show Eleanor the moment where she decided to come clean about her mistaken identity back in the first attempt in the afterlife. Eleanor was next shown the time when Michael decided to inform everyone that they were in the Bad Place from the beginning. Eleanor continued to counter Michael’s evidence by stating that all of his decisions were pre-determined. Michael and Eleanor went to the airport to pick up the others. Michael decided to take the group to rural Canada. 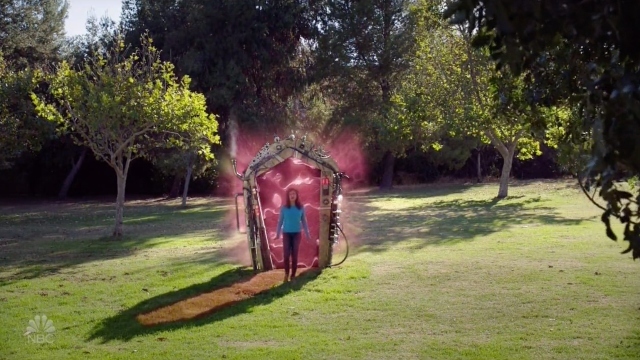 Meanwhile, Shaun and the demons of the Bad Place had managed to construct a working portal to Earth and they came through the portal. What did you think about The Good Place season 3 episode 7? Let us know in the comment section down below!